Discontinued. The Alpha CD24R is a gas fuelled condensing boiler which offers versatility through its considerate design and compact size. The highly engineered concept has been created specifically to reduce fuel intake further significantly reducing running costs. This reduced fuel usage is predominantly achieved through a stainless steel heat exchanger which ensures not only efficient but very quiet usage equally greatly reducing fuel wastage. Whilst increased efficiency is primarily beneficial to the user in terms of financial savings it equally poses benefits towards the environment as heightened efficiency means less carbon dioxide output. Easy access mains connection including an already connected two metre flying lead. 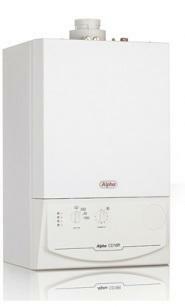 Here Alpha offers a new boiler to increase their already extensive range. The boiler has been designed with the user in mind at every stage. The compact design and lightweight nature allow a 'one man lift' system of insulation and with splash proof technology the Alpha CD24R integrates easily into a working home. Further the increased efficiency of the stainless steel heat exchanger is beneficial not only in reducing costs but to the environment making this a highly formidable boiler.